On the desolate banks of the Rio Puerco ("Pig "or "Dirty" River), a tributary of the Rio Grande in central New Mexico, is an archaeological site known as Pottery Mound, so named for the profusion of ancient pottery fragments scattered about the ground over several acres (in fact it is hardly possible to take a step on the site without treading on shards of ancient decorated pottery). 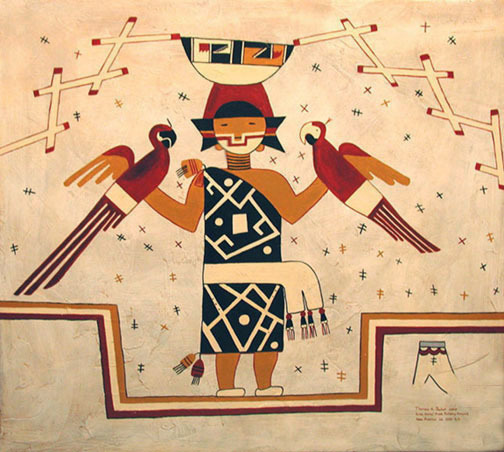 Here in the late 1950's and early 60's the Archaeological Field School of the University of New Mexico, under the direction of archaeologist Dr. Frank Hibben, excavated a series of subterranean rooms or kivas upon whose walls were a found a remarkable series of murals depicting the life and ceremonies of a vanished people. The one-time inhabitants of Pottery Mound are classified as a prehistoric or Stone Age culture because no evidence of writing or metals have been found there. They lived in crude communal apartment complexes constructed of adobe mud. These were a farming people in a semi-desert land, whose religion was oriented toward the bringing of precious rain to their crops of corn, beans, squash, and possibly also the cotton from which their textiles were woven. There is evidence in some of the murals of ritual human sacrifice, and some have also interpreted the fragmentary human bones scattered about the mound as evidence of cannibalism (see my painting Anasazi Kitchen). Pottery Mound was a thriving community from about AD 1200 to 1475, but had been abandoned by the time Europeans (Spanish) first entered the area in 1540. The mural that I reproduced above depicts a woman wearing ceremonial face paint holding a pair of scarlet macaws. These large, colorful parrots were not native to the American Southwest, but were imported to Pottery Mound from the tropical forests of Central and South America, hundreds of miles away. The brilliant colors of the birds' feathers created a striking contrast to the pervasive dull earthtones of this land of desert scenery, which made them especially prized by the people of Pottery Mound, if we may judge from the numerous times they appear in the ancient Pottery Mound murals. The Pottery Mound artists painted their murals on walls of whitewashed adobe, or mud plaster, using paints made from ground earths, charcoal, and vegetable dyes of various colors mixed into water and/or animal fat grease. The paint was applied either with the fingers or with a brush made by chewing the end of a slender Yucca leaf until it was soft and pliable. 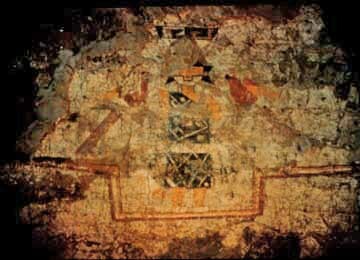 The murals were painted in layers on the walls of the underground rooms, one painting atop another over a period of possibly years, so that during the archaeological work each layer had to be removed to expose the paintings beneath it. This necessarily destroyed the paintings as the work progressed, leading Dr. Hibben to eventually halt the work until some means (as yet undiscovered) could be found to lift the murals off intact and preserve them. Hibben estimated that 80 percent of the paintings of Pottery Mound are still under the ground at the site, undisturbed, a fabulous ancient art treasure still awaiting discovery. To create this painting, I first analyzed photographs of the original, fragmentary mural and then reconstructed it as I believe it originally appeared. I painted it using oil paints on a wooden panel that I first coated with a special plaster to replicate the texture of the original walls of the ancient kiva. The modern earth colors were mixed so as to duplicate as closely as possible the original earthtones of the ancient artist's palette. Dr. Hibben authored a book about the Pottery Mound murals published in 1975 entitled "Kiva Art of the Anasazi at Pottery Mound" (KC Publications of Las Vegas, Nevada). The word Anasazi is a Navajo Indian term usually translated as "The Ancient Ones" (although it more accurately means "ancient enemies"). Of his book Dr. Hibben wrote: "Its primary purpose is to present these paintings to the world. Explorations of the ethnological, ritualistic, and artistic content of the paintings will be left to scholars whose expertise lies in those fields, and it will undoubtedly take many years for them to draw reliable conclusions from this wealth of material. It is indeed fortunate that, with this rare opportunity to see and examine these remarkable works of long-dead and nameless artists, such studies can now be pursued" (Introduction, p. xiii).